Since it opened almost two years ago, something has happened. The restaurant still has a very cool set up with its large patio and open second floor that has a New Orleans-esque railing and balcony. However, it doesn’t have much else going for it anymore. Over the past two years, our experiences have ranged from mediocre to just bizarre. One time during brunch, we watched in horror as a server argued with a table full of customers for several minutes when one of them mentioned that he had messed up their order. Another time during brunch our eggs benedict came out with an alleged “special” sauce on the side: it turned out to be caesar salad dressing. Cajun food that was initially promising (if somewhat expensive) has turned into overpriced dishes that lack freshness and taste (based upon their website it appears the initial chef has departed). 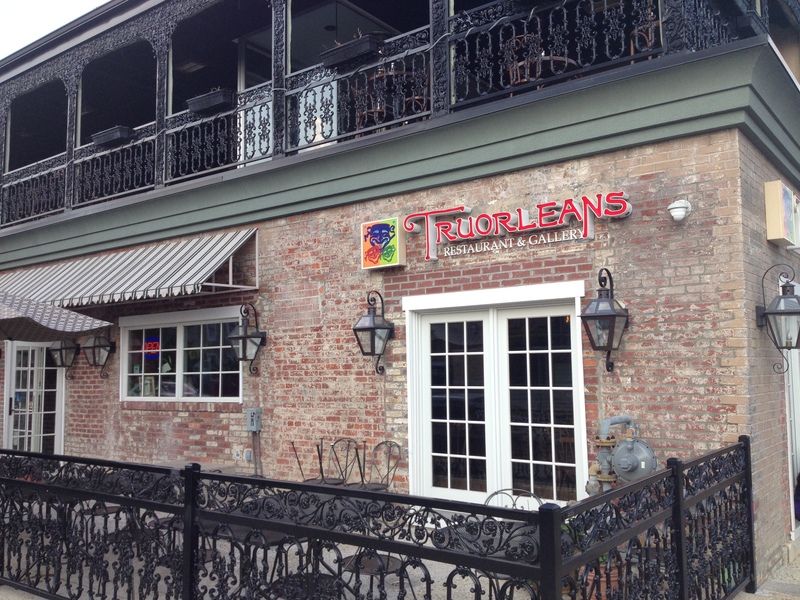 Tru Orleans has also been accused of being a bad neighbor. Frequently when one passes the restaurant late at night it resembles more of a club than a restaurant with music blasting so loud that it rocks the entire block. It frequently hosts large parties with a DJ on the open second floor, so that the music projects into the street. Several neighbors are protesting the renewal of Tru Orleans’ liquor license arguing that it has become a nuisance and a problem for neighbors. At recent community meetings we’ve heard stories about how nearby neighbors struggle to sleep some weekends because the music is so loud (apparently the restaurant has toned it back slightly because the renewal of its liquor license is under protest). This is a shame. The restaurant is in a prime location and structurally has a great environment. Initially, it had pretty good food and much better service. We hope that as its two year anniversary approaches the restaurant’s management will do a review and improve. The neighborhood currently deserves better. I have to concur instead of investing money in making this a true New Orleans spot more time has been spent in just trying to rake in the money by any means necessary. The food is horrible and they should hang there heads in shame for even suggesting they have any thing to do with the great city of New Orleans. Tru Mess would be more like it. The quality of the food has always been inconsistent, and in my experience, the waitstaff seems to know little to nothing about the cuisine the restaurant pretends to serve, and consequently can’t answer questions with anything but bad guesses. We never go there anymore. The fried oysters were not bad. The kitchen seems disorganized and so does the waitstaff. I spoke with a manager about it a long time ago and though he seemed to listen they never improved. It’s a real shame and a lost opportunity. They seem to have found some success with a late night drinking crowd. It’s too bad they don’t take service and the cuisine seriously. A neighbor had a bad experience (not being served and ignored) that she felt was racially motivated since they were the only white patrons.